In all honesty, I’m a little picky when it comes to citrus flavors. I like lemons, but there are certain lemon desserts and other dishes that I keep at arm’s length… but lemon poppyseed is a combination that I usually give a bear hug. I catch myself lingering in the bakery at the store when I spot the muffins to see if they have any of these flavor. Sometimes they do, but most of the time they don’t have the large ones that I’m looking for. In fact, last time I pooched my lower lip out when I saw there weren’t any and moved on…only to buy ingredients to make my own. My husband recently told me that he likes flatter cookies that are still soft. I told him that he’s nuts, because I’m a huge fan of fluffy cookies myself…but after a few batches of making different types of cookies and making them slightly thinner, I can certainly see the appeal (although I still love fluffy cookies). I did make a boo boo the first time around with these, though. I got the brilliant idea of dipping the cookie dough in freshly squeezed lemon juice before the sugar, then placing on the baking pan. Well, the extra juice from the lemon on top of the cookie dough really changed the consistency of the cookies. They were almost paper thin, and spread out all over the place. Lesson learned! The last dozen of the batch, I just rolled them in sugar before baking…and the consistency was just right. 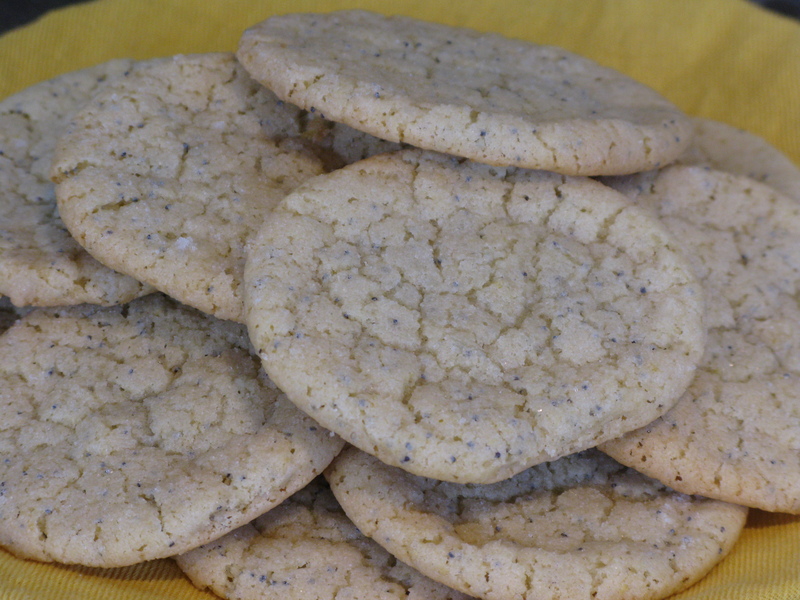 While explaining these to my husband through text message, the best way I could think of to explain to him was that these were like lemon sugar cookies…with a bunch of little black dots. Preheat oven to 350 degrees. Cream butter and sugar together until fluffy, using electric mixer. Add eggs, grated lemon peel and vanilla, continue beating. In another small bowl, combine flour, baking soda, salt and poppyseeds. Gradually add to creamed mixture, beating until combined. Using a cookie scoop to measure out dough, roll in extra sugar. Place on baking sheet, and baking for 10-12 minutes, or until tops are a very light golden color. Remove from oven, transfer cookies to cooling rack to cool completely. Store in airtight container.